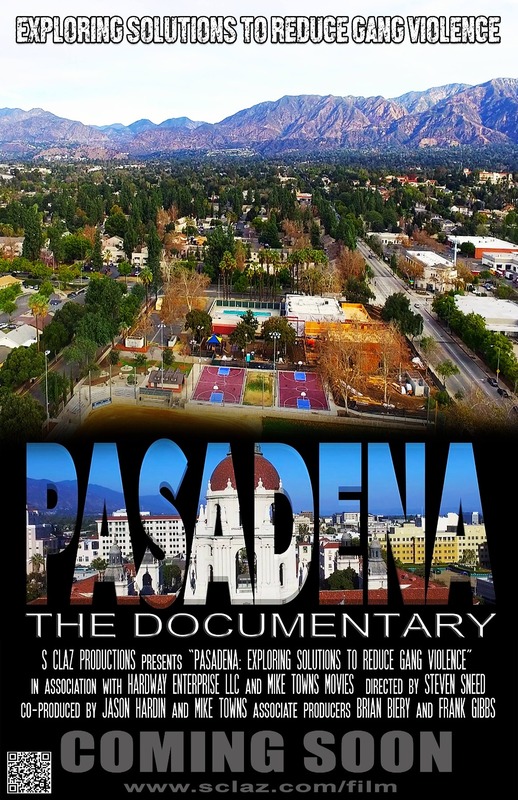 PASADENA: Exploring Solutions To Reduce Gang Violence, is a documentary that is sure to shed light on the dynamics of gang violence that plagues the 23 square mile world-renowned city of Pasadena California. The film contains exclusive interviews from individuals that have been involved and greatly impacted by the gang lifestyle, community members, local professionals, and service providers that deal with this issue daily. The purpose of this film is to create awareness, bring people together, spark an open dialog, hear different perspectives, and explore solutions to reduce gang violence. Words are powerful, and we strive to create an open dialog that will result in real solutions to a very serious problem. Following each of our “Special Event Screenings”, there will be a forum featuring a guest moderator, the director, a panel of interviewees from the film, and a brief Q&A with attendees. This interactive experience will allow the audience the opportunity to truly connect, walk away with a new understanding, and hopefully a desire to become part of the solution. Together, we can make a huge difference. Steven Sneed was greatly impacted by gang violence growing up in Pasadena California. Witnessing a man being shot and killed and losing family and friends to the justice system was traumatizing as a youth. After surviving many close encounters with gang culture, Mr. Sneed, dedicated his life to Intervention work with the youth. From 1999-2000, Mr. Sneed was an Instructional Aide for Pasadena Unified School District at Longfellow Elementary. From 2000 to 2010, Mr. Sneed was a Behavior Specialist for Pasadena Unified School District at Longfellow Elementary. From 2010 to 2015, Mr. Sneed was a Youth Specialist with Hathaway-Sycamore’s School Based Services at Pasadena High School. In 2016, Mr. Sneed became a district wide Intervention Specialist for the Pasadena Unified School District. Mr. Sneed created; behavioral support plans for at risk students, facilitated after-school mentoring groups at 4 elementary schools (Washington, Franklin, Jackson, & Madison), conducted conflict resolution trainings for staff, provided behavioral support to the Skills summer program, and lead gang prevention presentations to over 140 middle and high school students. In the summer of 2017, Mr. Sneed was laid off due to budget cuts in the Pasadena Unified School District. Despite the sudden devastation, Mr. Sneed continued his journey to give back. Mr. Sneed joined the Violence Prevention Planning Committee for the city of Pasadena. After discussing Intervention and Prevention with some of Pasadena’s most influential figures, Mr. Sneed was inspired to direct a film on gang violence in Pasadena. The purpose of this film is to create awareness, bring people together, spark an open dialog, hear different perspectives, and explore solutions to reduce gang violence. Filled with inspiration, Mr. Sneed joined Collaborate Pasadena’s Neighborhood Leadership Institute (PNLI). The 10 weeks, 30 hours course, was life changing. Mr. Sneed was introduced to many of Pasadena’s elite, such as the Mayor, commissioners, Supreme Court judge, chief of police, the superintendent, numerous city officials, and countless active community members. During the 10 weeks an unexpected relationship developed between Mr. Sneed and PNLI Facilitator & Activist, Brian Biery. Mr. Biery was intrigued by Mr. Sneed’s vision and came aboard as an Associate Producer to contribute to the film. Thanks to Jason Hardin, Michael Towns, Paco Swartz, and Frank Gibbs the documentary titled “Pasadena” has officially begun production. We thank you in advance. Please spread the word! We have officially wrapped up filming. We are headed into post production and editing. Thank you for all of you support! Peace In Dena T Shirt, Made In Dena T Shirt, DVD, Special Thanks in film, 4 VIP seats to screening, dinner with Director & Crew. Peace In Dena & Made In Dena T Shirts, DVD, Special Thanks in film, 4 VIP seats, Associate Producer credit, dinner with film crew, & Private Screening.